I’d been toying with the idea of trying out a new embroidery stitch every week, but I hadn’t quite gotten around to starting. Then last week I found Take a Stitch Tuesday at Pintangle, and it was exactly like what I had in mind. Only, you know, organized and stuff. I started an embarrassingly wobbly-looking sampler and learned two stitches last week and one this week. Last week I was using a hoop that kept slipping, which contributed to the wobbliness. I’ve wrapped the inner part of the hoop in first aid tape, which has helped a lot, but I think I need to pick up some non-bargain-basement hoops or a bigger q-snap frame. I really like the q-snap frame I’ve been using for the calavera project, and I have a small plastic hoop that I like, but my bigger ones are all cheapie balsa ones that I got at a thrift store and they’re a little problematic to use. 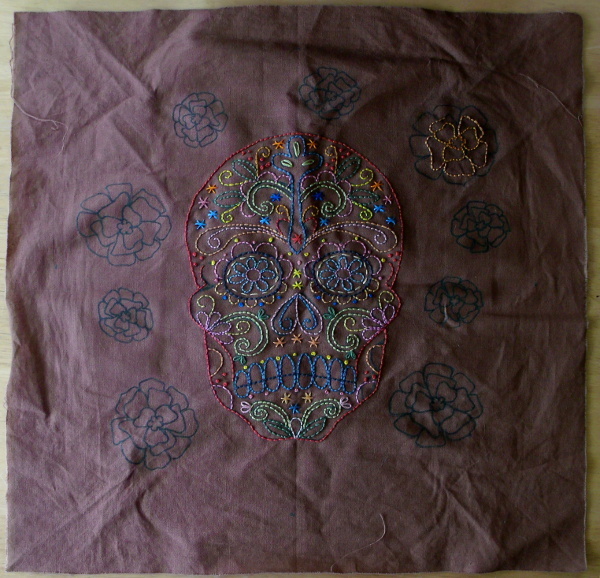 And I finally finished the skull part of the calavera embroidery project! Last night I transferred a handful of marigolds and started on those. I considered filling the marigolds rather than just outlining them but decided against it figuring it might look odd since the skull is all outlining. I measured it, and I did indeed cut the fabric too small for a 14″ pillow — 14½, and I’ve lost about an eighth inch to fraying since I hadn’t yet learned how to neaten the edges to keep it from fraying when I started it. I decided to just go ahead and make it 12″ instead and made sure to keep the marigolds within that size. 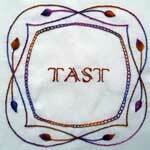 Welcome to TAST. It is indeed a great way to learn new stitches, explore new ways of using them and sharing with others your ideas. I agree with you; the Feather stitch is great fun! Wait until you have tried some of the variations of the stitch. The possibilities are endless. You could always add strips of fabric around the sides to make it bigger. Make them wider than you need and when you are done you can trim to size. Great skull! I love the skull. 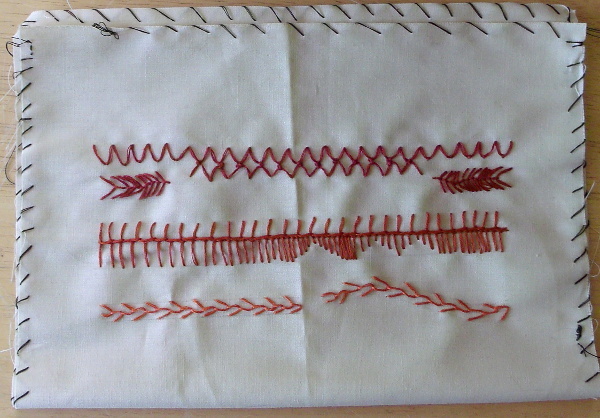 I’ve been playing with embroidery stitches (not details, more large and, tee hee, “primitive style”) in my quilting. I love the interplay of embroidery stitches with quilting stitches and want to push myself further on that. Your skull is very cool and colorful–love the way the different stitches interact with each other. I love the skull and your choice to just embroider the Marigold outlines is just right!